Looking for something awesome for kids to do? Check out Richmond Young Writers! 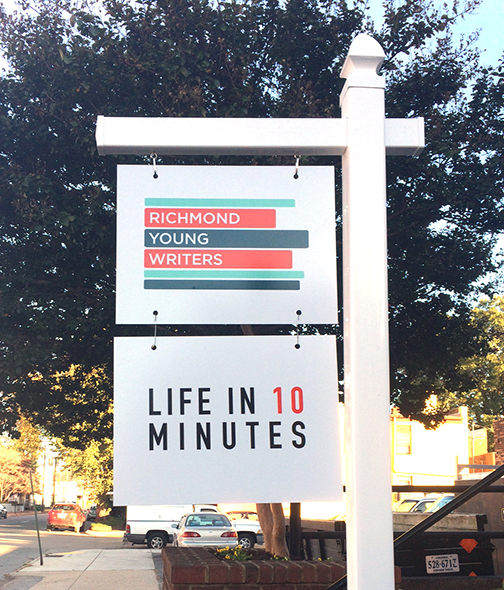 Richmond Young Writers is a creative writing incubator for ages 9-17. We write, we read, we laugh, we cry, we get messy, we polish things up, we bond. We make each other better. RYW offers once-a-week fall and winter/spring after-school workshops in fiction, poetry, creative nonfiction, journalism, comics, and other topics. In the summer, we offer 18 different week-long creative writing camps, complete with amazing guest author appearances, snacks, deep thoughts, wordy goodness and a new crew of crazy writer friends. Richmond Young Writers was founded in the summer of 2009 at Chop Suey Books with the intention of introducing young people to the joy of creative writing through workshops taught by professional writers in the community. Our workshops are now held right down the street at 2707 West Cary Street. Full and partial scholarships are offered in each workshop to ensure that all students have the opportunity to participate in our programs. We have had the pleasure of writing with young people ages 8-17 from Richmond, Henrico, Glen Allen, Ashland, Chesterfield, Midlothian, Montpelier, Powhatan, Moseley, Mechanicsville, Afton, Rockville, Gloucester, Charlottesville and more. Last Day of Our Winter Warmth Drive! Please Donate! So cold outside, and folks in our community still need your help. Our Winter Warmth Drive ends today! What does DACA mean to you? The end of TPS for Salvadorans and Haitians? New immigration policies? ¿Qué te significa DACA? ¿Nuevas políticas de inmigración? 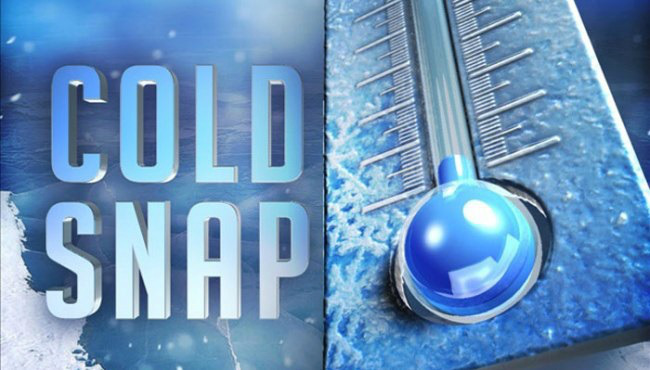 The Cold Weather Overflow Shelter will be open Tuesday, January 30 – Thursday, February 1 as temperatures are forecast to remain at or below 40 degrees. Residents in need of overnight shelter are asked to report to Commonwealth Catholic Charities (511 W. Grace Street) during operational hours for a comprehensive intake and referral to the appropriate shelter. Shelter registration is from 7 p.m. to 9 p.m.
For individuals who are not eligible for existing shelter space or if all available beds have been filled, Commonwealth Catholic Charities will provide a referral to the Cold Weather Overflow Shelter. The Cold Weather Overflow Shelter is located in the City’s Public Safety Building at 505 North 9th Street. The shelter opens each evening at 7 p.m. and closes the following morning at 10 a.m. Individuals seeking access to the Overflow Shelter must have a referral. Food will not be provided and pets are not allowed. City residents are also advised the Department of Social Services provides emergency assistance with gas and electric disconnection notices for residents who qualify. Residents may also call the Fuel Line at (804) 646-7046. The elderly or residents with disabilities should contact Senior Connections for assistance at (804) 343-3000, Monday through Friday; 9 a.m. to 5 p.m.
For more information, please contact Commonwealth Catholic Charities at (804) 648-4177. They're calling for snow in Central Virginia again this week. The cold's going to last for a while. And your community needs your help. We'll be collecting until February 5th! 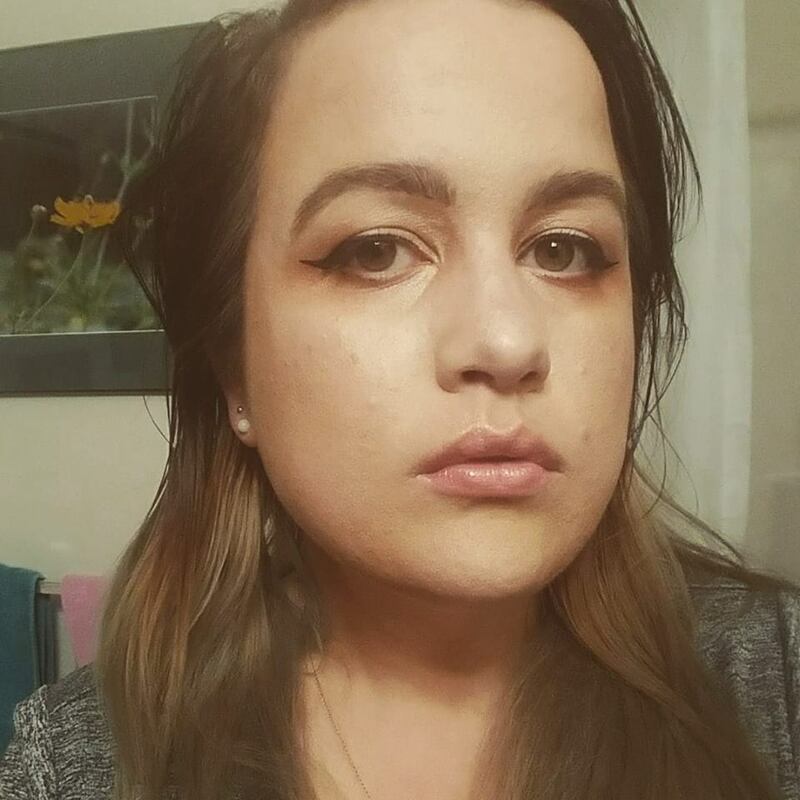 Madeline’s House is a non-profit organization, providing comprehensive services for individuals and families experiencing domestic and sexual abuse. We receive and are dependent upon support from local sources: civic groups, religious groups, businesses, private citizens and grants. Income is also generated through various community fundraising events. Supporting these individuals in ending their experience of violence and homelessness through client advocacy, counseling, and community support systems. Public awareness is the key to changing long term attitudes about domestic violence (DV) and sexual assault (SA). Finding a safe haven from this abuse is an immediate and life saving concern. Madeline’s House has been established in response to the cry of DV and SA victim’s immediate need for help and safety. It is our intent to inspire these women and children to become survivors and assist them in regaining control of their lives. In addition to the wide range of services we provide, our goal is to help them restore their self-esteem. Counseling, therapy, and a supportive family environment within the shelter help to rebuild the independence necessary for reentering the community to live a safe and productive new life. 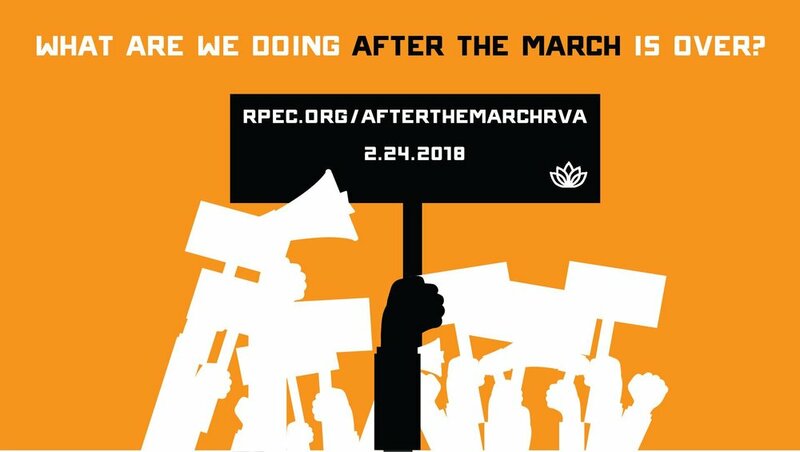 Timed approximately one year after the Trump inauguration, the After the March RVA Activism Convening is an effort by the Richmond Peace Education Center to bring together those that are and want to participate in work aimed at achieving equality. The convening will feature workshops, community conversations, and movement building/networking time. The registration below holds more information about the workshops and conversations. When is it? And Where? Saturday, February 24th, 2018 at Diversity Richmond (1407 Sherwood Ave) from 12pm to 5:30pm. It is free and open to the public. However, we are asking you to please register. Everyone! Anyone who is (or has) been doing work to better the community and those who are looking to get involved in creating change have a place here. We hope that you leave After the March with a new or deepened network of folks to work in movement with and with new or deepened "real life" skills. In addition, some of the workshops at After the March will continue to be offered by the Peace Center throughout 2018. The intention behind After the March is to be engaged in the long-term, so this is not a one & done convening. The Richmond Peace Education Center (RPEC) works to build just, inclusive and nonviolent communities through education and action. Heads Up, #RVA!, Richmond area peeps!, please share! Our Winter Warmth Drive is what we're calling a mirror event, with the Central Virginia Chapter of Writing for Peace organizing similar projects across our home region. Coats, Hats, Gloves, Socks, Blankets, Sleeping Bags! We'll be collecting these much needed items from January 22, 2018-February 5, 2018. Thanks to the generous and compassionate people of RVA Hospitality and Tricycle Gardens, we are collecting warm clothing and winter gear to help our homeless and in-need community members get through this snow and cold weather with a bit more comfort. All collected items will be distributed to local in-need families and homeless community members. Please bring any items you can to one of the collection locations and encourage your friends and family to do so as well. 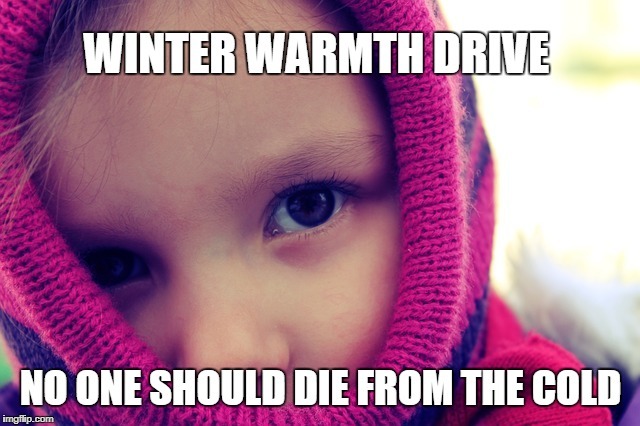 NO ONE SHOULD DIE FROM THE COLD. Homeward is the planning and coordinating organization for homeless services in the greater Richmond region, and they need your help! "Understanding what regional data says about individuals and families experiencing homelessness is critical in building an effective community-wide response. For this reason, the U.S. Department of Housing and Urban Development (HUD) requires communities to conduct periodic counts of people experiencing homelessness. This data is compiled both locally and nationally to inform programs, planning, and funding. Homeward has coordinated Greater Richmond's Point-in-Time (PIT) count since 1999, and since 2007, has conducted both a summer and a winter count to better understand the changing nature of homelessness over time." Training sessions will be held in advance. At the event, we will offer those experiencing homelessness care packages which contain lotion, soap, toothpaste, toothbrushes, shampoo, deodorant, hand sanitizer, combs, brushes, socks, scarves and hats. EFFECTIVE IMMEDIATELY, DECEMBER 1, 2017 UNTIL APRIL 15, 2018 THE COLD WEATHER OVERFLOW SHELTER HOURS OF OPERATION WILL BE 7 P.M. UNTIL 10 A.M. The Cold Weather Overflow Shelter will be open Wednesday, December 29 – Thursday, January 4th, 2017 as temperatures are forecast to remain at or below 40 degrees. Residents in need of overnight shelter are asked to report to Commonwealth Catholic Charities (511 W. Grace Street) during operational hours for a comprehensive intake and referral to the appropriate shelter. Shelter registration is from 7 p.m. to 9 p.m. For individuals who are not eligible for existing shelter space or if all available beds have been filled, Commonwealth Catholic Charities will provide a referral to the Cold Weather Overflow Shelter....."
"City residents are also advised the Department of Social Services provides emergency assistance with gas and electric disconnection notices for residents who qualify. Residents may also call the Fuel Line at (804) 646-7046. The elderly or residents with disabilities should contact Senior Connections for assistance at (804) 343-3000, Monday through Friday; 9 a.m. to 5 p.m....."